The power of storytelling…it dramatizes, delights, and immerses us in an experience so that we can step back into the world, ready to face challenges with a little more confidence and understanding. At AOS, seventh and eighth grade students participate in the “History as Story” writing workshop with visiting authors who are experts in the power of storytelling. 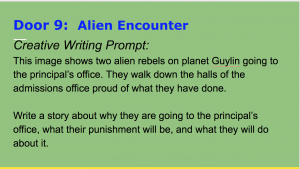 The goal of the writing workshop is to connect students with themes of history as the students themselves craft a small work of historical fiction. 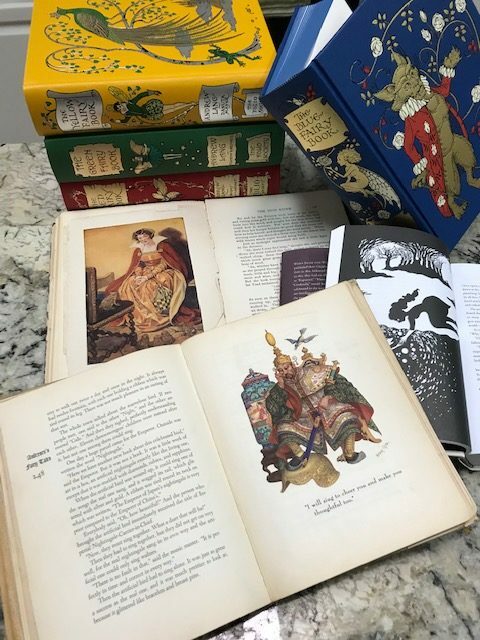 The historical fiction piece engages students more deeply with topics they have been researching, topics that will be developed later in a more formal research essay. This year the “History as Story” writing workshop was led by poet and author Allan Wolf, who paints a picture of history through various viewpoints in books-in-verse, such as New Found Land (Lewis and Clark expedition) and The Watch that Ends the Night (sinking of the Titanic). Allan Wolf suggested that students develop their historical fiction piece by using CAST: Characters, Action, Setting, and Truth. The following sample pieces show how students used CAST to connect with a Truth about their historical topics and re-imagined a moment in history. Seventh graders researched American reformers of the late 1700s-1800s in a “Be the Change” research project. The opening paragraph of the research paper is a historical vignette that immerses the reader in a dramatic moment of their American reformer. It was the middle of the night. A yellow moon and its pale, waxy light slowly disappeared under ominous storm clouds, and the skies opened up. The ship was low in rations, and the bodies of the passengers, frail from malnutrition, hardly caused a tip in the hardy vessel, the Mariah, as they began worship. It didn’t bother Ann. Her light hair grew steadily darker in the rain, and, as on all nights, she began to spin. Uncontrolled, sporadic movements overtook her body, mimicking the crashing of the tumultuous sea. “Praise God,” she whispered, and the ship erupted in a soulful, oscillating waltz. And the rain persisted. The rain came down and the captain came up to handle it and through it all she continued to dance. After all, they were alive and God was with them and that trumped a squall any day. Even though they were ordered back to their rooms. Even though the wind whipped her hair and cut at her face. “Below deck!” The captain screamed. “Or it’s overboard for the lot of ya!” His voice was hoarse from shouting at the crew. His patience with Ann and her followers, never in abundant supply, was rapidly wearing thin. “That shaking of yours will be put to a stop, whether its by my hand or God’s when we die in this bloody monsoon!” He jerked on the wheel. Abruptly, the largest wave so far, one of Brobdingnagian proportions, drew close to the ship. Captain Nelson swore. Baker began to say his prayers. Ann danced. And, as if guided by the hand of God himself, the wave carried the board back into place. The Mariah began to rise. It was the middle of the night. A yellow moon and its pale, waxy light shone through retreating storm clouds. Eighth graders researched defining moments in US history and iconic persons who influenced those events. As part of their research, students located a primary source photo and used the Library of Congress Analysis Tool to examine how the photo revealed insights into their historical event or person. In the writing workshop, these photos were used to develop descriptive, narrative poems (ekphrastic poetry). Here is an example of how one student, Emma, used the CAST technique with her photograph to reveal insights about the Texas Western 1966 NCAA Championship. They had to win to make their statement. Connected in more than just great pride. The “History as Story” writing workshop is an exciting opportunity for students to add their voice as they shape an understanding of history. I encourage you to find a moment in history that fascinates you and, through the power of storytelling, look closely and think deeply about truths that have shaped our Nation. Immersing young writers in models of fine writing was an idea echoed during a 2017 NCTE conference session on literary magazines. This session was a wonderful brain trust for individuals new to sponsoring a school’s literary magazine. In addition to bringing back copies of other schools’ literary magazines, I brought back the advice repeatedly heard: provide student writers with models of good writing and read, read, read. 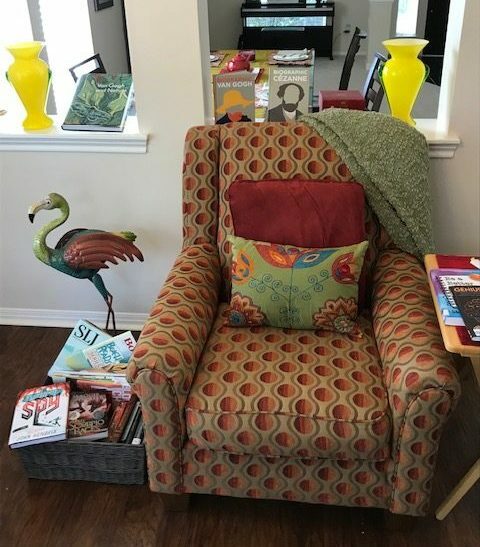 In an earlier AISL blog, “Inspire Writing with Memorials,” I mentioned that our library and student LitMag editors are sponsoring a writing contest. Our LitMag editors were challenged to make promotional posters that not only advertised the contest, but also featured a poem example reflecting the contest theme of memorials or collections. As our LitMag editors searched for models of well-crafted poems, the library poetry book shelves became a cornucopia of inspirational ideas. Below are two examples of poetry books that sparked imaginations, along with students’ poem reflections and poster design decisions. Margarita Engle, named in 2017 as the Young People’s Poet Laureate, celebrates the lives of Hispanic people from all walks of life in this collection of poems. Design principle for poster: Symmetry. Silhouetted horse heads face each other on the poster and displayed below are flags of Mexico and the United States of America, indicating the duel heritage of cowboy Arnold Rojas. Maya Angelou (Poetry for Young People). Design Principle for poster: Repetition. This process of selecting poems to model well-crafted writing was a creative stretch for our LitMag editors: an opportunity both for design thinking and personal reflection on how poems communicate to an audience. The finished posters are now displayed throughout the school, inspiring our young writers through reading poems by established poets. Kwame and co-authors pay tribute to famous poets by imitating the poetic style or enkindling the emotional connection of these poets. Lewis, the 2011 Children’s Poet Laureate, writes poems in the style of Edward Lear to honor Lear’s whimsical language and playful use of the sounds of words. To read more on how NCTE supports school literary magazines, see REALM Awards (Recognizing Excellence in Art and Literary Magazines). Memorials promote powerful, personal encounters with moments in history. I recently created my own memorial to commemorate a time in which my newly married parents were separated during World War II. The assemblage of photos and letters documented the years 1942-1945, when my father, JJ, was setting up radio communications in Iceland while my mother, Wanda, worked in an ammunition plant and then, later, stayed at home raising a newborn son (my brother, Joe). 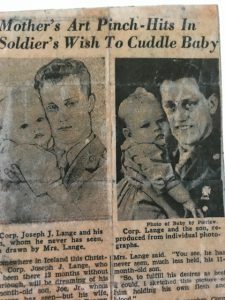 The centerpiece of the memorial was a newspaper clipping that featured a story about my mother’s drawing of my father holding his newborn son. The idea that prompted the drawing was that JJ had never seen or held the newborn. Wanda created the drawing by viewing a photo of her husband in uniform and then adding the baby in his arms. When Wanda sent this drawing in the mail, the army “censors” discovered the drawing; they then shared the drawing and story with the St. Louis newspaper. A photographer at the newspaper created a photo montage; using a photo of my father dressed in his army uniform, the photographer combined it with the baby’s photo. In addition to this newspaper clipping, the memorial contains several letters that JJ wrote, including the letter that tipped off Wanda about his destination in the war. Before JJ left for army training, they discussed that letters would be censored (“Idle Gossip Sinks Ships” was stamped at the bottom of his army stationary). So my father devised a code: when he knew the location of his war assignment, the first word of that letter to my mother would indicate the country by the initial letter of the word. 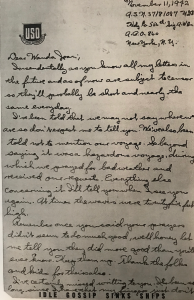 JJ’s letter dated on November 11, 1942 began “Incidentally, as you know all my letters in the future and as of now are subject to censor….” He intended to signal that he would be stationed in Iceland, but my mother in a panic thought the letter “I” stood for Italy and that JJ was headed to the fierce combat. A final item that I included in the memorial was a harmonica. As the story goes, when my father arrived home to be welcomed by my mother and the 2 ½ year-old son, a son he had never seen in person, my young brother clung nervously to my mother’s dress, fearful of this tall, strange man with the booming voice. My father crouched down and dropped the duffle bag from his shoulder. As he unzipped the bag, he brought out a shiny harmonica, blew across it, and handed this magical, musical object to his son, winning him over. Combine the power of a Google Search with the expertise of a librarian assembling the websites for students to search. The Google Custom Search box can be embedded on your library resource page. I plan to explore further the option to register as an educational nonprofit to turn off ads on the Google Search boxes. Here is a Symbaloo that I created to begin curating resources for Copyright and Fair Use, Digital Citizenship, and Media and News Literacy. Visually organize content in grids. 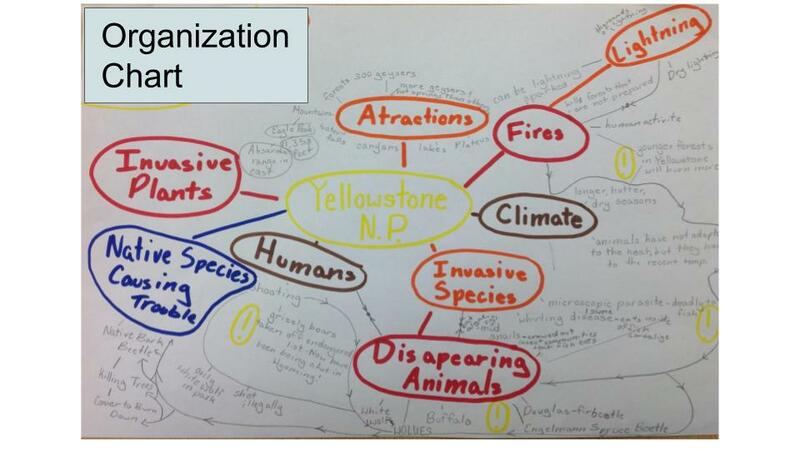 Here is an example of Joyce Valenza’s Pearltree and a blog by Richard Byrne about Pearltrees (FreeTech4Teachers). Bring together videos, photos, and documents into a visual grid that encourages exploring resources. I have also assembled a list of suggested books that can be used to introduce our students to the idea of curation and promote its value in the research process. Author Fleming dramatizes a true moment in the life of artist Joseph Cornell: as a young boy, Joey was fascinated by collecting things and he organized a special ticketed event for friends and family to view his collections. This is my favorite version of Potter’s young life because it shows her fascination with exploring nature and desire to be a scientist. Unable to pursue this scientific field because she was a woman in the Victorian Period, she turned her love of nature to creating delightful drawings for the Peter Rabbit tales. A grandfather shares his special matchboxes with his granddaughter. Each matchbox contains a small object that marks a moment in his immigrant story. A young child explores a grandmother’s collection of pennies; the year on each penny designates significant events in the grandmother’s life. What Darwin Saw: The Journey that Changed the World by Rosalyn Schanzer (Biography) . Darwin’s natural collections and observations in his notebooks fueled his scientific theories. The Journals of Lewis and Clark by Darlene R. Stille This historical look at the expedition of Lewis and Clark includes primary source drawings and diary entries from Lewis and Clark’s journal. Dorothea Lange’s documentation of social issues through her photos is a great example of sharing important ideas with an audience. This fiction story is loosely based on an Outsider artist whose cast-off sculpture assemblages were exhibited at the Smithsonian. A young boy is assigned community service with this “junk man,” and the boy begins to find personal healing as he assists in gathering the pieces for the sculpture. 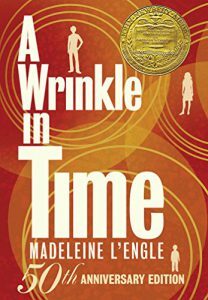 In this historical fiction novel, a teenage girl is assigned to community service, assisting an elderly woman in cleaning out her attic. What they discover together is a treasure trove of memories of the elderly woman’s experience as an orphan train child. grandmother’s grandparents, and it prompted Baker to begin a life-long project of collecting oral history interviews and photographs that were later assembled as part of a special exhibit at the Tennessee History Museum. Director Guillermo del Toro surrounds himself with curiosities and collections that help to inspire him in his movie projects. This book is filled with his sketches, journal entries, and collections from his estate that inspire his imaginative works. Looking forward to hearing your ideas on how librarians can engage students’ curiosity and encourage their desire to become curators of knowledge. 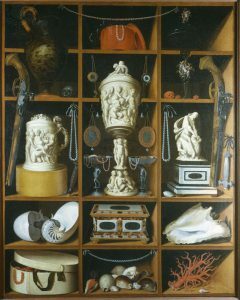 Georg Hainz Cabinet of Curiosities. Fine Art. Britannica ImageQuest, Encyclopædia Britannica, 25 May 2016. quest.eb.com/search/109_111663/1/109_111663/cite. Searching a special collections archive can at times feel as mind-boggling as finding the wrinkles that lead you to another time dimension. How do you find those “magical portals,” entry points to archives, and simplify daunting site navigation? 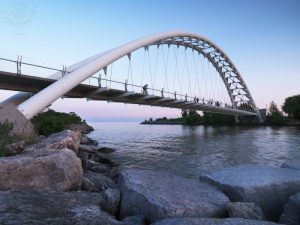 Though the role of librarians has evolved from that of “gatekeeper,” “gatekeeper” does have a metaphysical ring to it–conjuring up a scene from Monty Python in which you must correctly answer the riddle posed by the bridge keeper or risk being hurtled into the abyss. The challenge for librarians is to identify entry points and model search strategies, thereby minimizing frustration and building students’ skills as independent researchers. Fifth graders have been exploring the lives of scientists and inventors and applying design thinking to their research. Challenged to find examples of how society reacted to the science discoveries, students used the podcast articles from Engines of Our Ingenuity, written and hosted by Dr. John Lienhard in association with the University of Houston and Houston Public Media. One student unearthed a gem in the article “Darwin Boards the Beagle.” Darwin was close friends with the captain of the Beagle at the beginning of the journey, but as the captain learned more about Darwin’s evolving theories, they collided with the captain’s own beliefs in the Bible and he become an enemy, participating in debates in Oxford to discredit Darwin. This article provided the student with an example of how society’s beliefs conflicted with Darwin’s discoveries. Search strategy: Rather than using the Engines of Our Ingenuity search box, an Advanced Google search provided more specific results. Topics in Chronicling America links historic newspapers themed to topics such as famous persons and events in Science and Technology. This is a much easier way for young researchers to navigate the Chronicling America archived newspapers through the Library of Congress. Search strategy: Select a topic, such as Invention of the Telephone, and click on newspaper article “A Wonderful Invention.” Scan the paper for red highlighted word and use the box finder tool to zoom in and read this article about how Alexander Graham Bell demonstrated his telephone to an enthusiastic audience. Seventh graders researched social reformers of the 1800s and were challenged to connect these reform movements to modern reform initiatives. In searching for articles on Laura Bridgman, the first blind and deaf girl to learn how to read and write, we discovered JSTOR Daily, an online publication that puts contemporary issues in historic context using research from the journals archived in JSTOR. The Laura Bridgman article, for example, explored the changing views towards special education. Search Strategy: A bonus to these JSTOR Daily articles is that they link to JSTOR journal articles. For instance, the Laura Bridgman article linked to a JSTOR journal article about Dr. Howe’s educational methods in teaching Laura to read and write. Constitution Daily blog showcases content from the National Constitution Center. The Scopes Trial article provides historic context to the trial as well as links to a Tennessee House Bill on Teaching Science (2011). 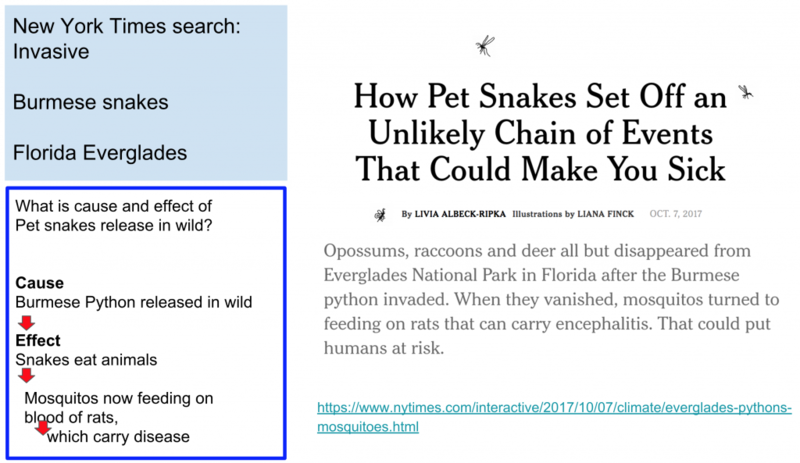 Search strategy: Rather than using the Constitution Daily search box, an Advanced Google search provided more specific results. Circulation Now blog links historic items from the US National Library of Medicine (NIH). The “Heart Surgery on Film” article discusses the work of one of the first female heart surgeons, Dr. Nina Braunwald, and the blog was written by a library graduate student, Rachel James. Search Strategy: I used this article by Rachel James to model search strategies and resources that Rachel used to develop her research on heart surgery. New York Times Archive themes articles to famous events and provides links to historic newspapers. This article on the Three Mile Island disaster links to a newspaper article written at the time. Though you need to be a subscriber to view the historic newspapers, the featured articles often contain specific examples from the primary source newspaper. In the “Should it be STEM or STEAM” debate, no one is a better poster child of how Science and Art complement each other than Leonardo da Vinci. Leonardo’s journals are filled with close observations of nature and the human body, as well as engineering drawings and notes detailing inventions, such as the precursors to the submarine, tank, and machines of the air. 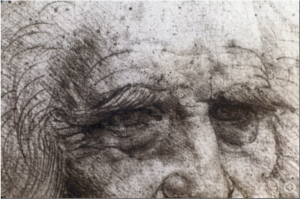 Our students will be exploring how to think like the Renaissance artist Leonardo da Vinci in preparation for a writing workshop with Diane Stanley, author of the biographies Leonardo and Michelangelo. Following are a few curricular collaborations that highlight the genius of two Renaissance thinkers and creators, Leonardo and Michelangelo. Librarian Eve Zehavi will guide fourth graders as they discuss quotes from Leonardo’s journals and look closely at his sketches to determine what Leonardo emphasized about the act of thinking and creating. How do you think like Leonardo? How do you see like Leonardo? How do you problem solve like Leonardo? 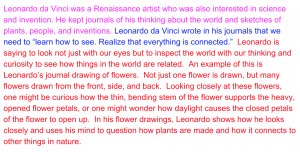 (3) summarize the quote in your own words and connect to meaning of the quote based on sketches and designs in Leonardo’s journals. Our sixth graders have been studying the Seven Wonders of the Ancient World and have been reading about the ancient artists and engineers who created them. 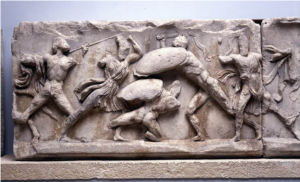 One ancient artist, Scopas, created a famous scene of Amazons battling Greek soldiers, which appears on columns of the Mausoleum of Halicarnassus. A history article described Scopas as a “Michelangelo of the Renaissance.” Discovering this comparison became the impetus to have students compare and contrast this Greek artist’s battle scene with famous battle scenes by Leonardo and Michelangelo. In one of the most famous painting competitions of the Renaissance, Leonardo and Michelangelo were each challenged to paint a battle scene glorifying the history of Florence. The paintings were to be on opposite walls of the same room of a Florentine republic council chamber. Leonardo was an older, established artist, and Michelangelo was a young, 25-year-old talented sculptor; both artists disliked each other and were very disparaging of each other’s artwork (Isaacson 367). Author Diane Stanley depicts this painting battle in her two books Leonardo and Michelangelo, and this article from The Guardian will also be shared with our sixth graders. First: discuss how the Scopas battle scene is similar to either Leonardo’s or Michelangelo’s battle scene (and use specific examples and descriptive words). Second: discuss how the Scopas and Renaissance battle scenes are different (and use specific examples and descriptive words). 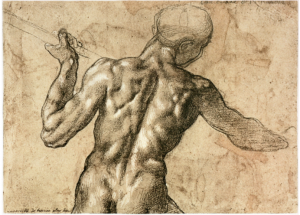 Third: discuss characteristics of Scopas’ style (Hellenistic art) and evolving characteristics in Michelangelo’s or Leonardo’s art style (Renaissance, Humanistic art). 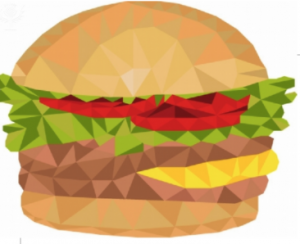 Hamburger Low Polygon. Clip Art. Britannica ImageQuest, Encyclopædia Britannica, 25 May 2016.
quest.eb.com/search/186_1628980/1/186_1628980/cite. Accessed 27 Dec 2017. 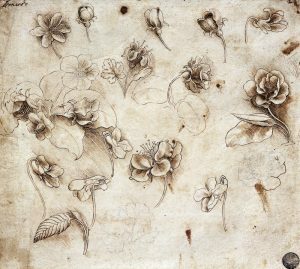 Botanical table by Leonardo da Vinci (1452-1519), drawing 237. Photograph. Britannica ImageQuest, Encyclopædia Britannica, 25 May 2016.
quest.eb.com/search/126_142634/1/126_142634/cite. Accessed 5 Jan 2018. The Mausoleum at Halicarnassus: The Amazon Frieze. British Museum. 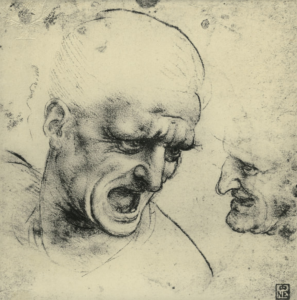 Leonardo, Heads of Warriors, Study. Photo. Britannica ImageQuest, Encyclopædia Britannica, 25 May 2016.
quest.eb.com/search/109_223586/1/109_223586/cite. Accessed 27 Dec 2017. Michelangelo. Battle of Cascina. 1504. Fordham Art History. Leonardo da Vinci. c. 1514. Britannica ImageQuest, Encyclopædia Britannica, 31 Aug 2017. quest.eb.com/search/140_1809909/1/140_1809909/cite. Accessed 7 Dec 2017. This year, new school construction provided opportunities for our middle school library. How do you prevent the Idea Wall from becoming a static space–a glorified bulletin board–and instead create a public space that ignites ideas, promotes discussions, encourages interactions, and makes visible a culture of learning in the school community? 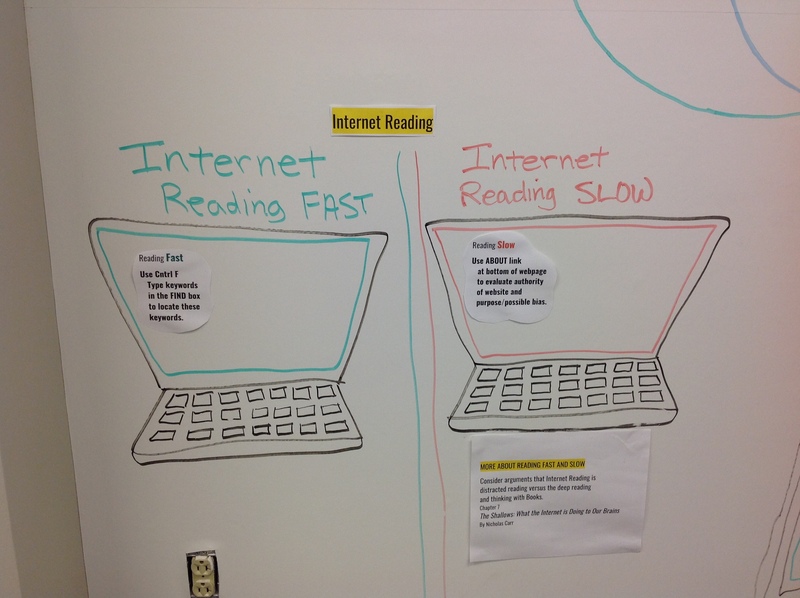 Here are a few ways the library has launched the Idea Wall. and Alice in Wonderland illustrations by Tenniel framed one large panel of the Idea Wall. Our school community was invited to write the titles of their favorites books featuring magical portals or doors as an important part of the storyline. We also had a Literary Door contest. 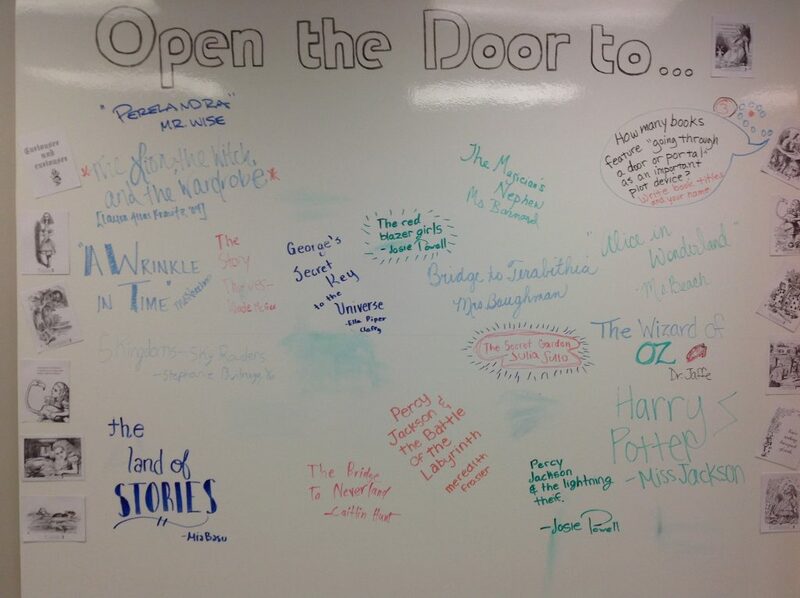 Students, faculty, administrators, and even visiting alumni had fun adding the title of their favorite books to the Idea Wall. October’s Idea Wall theme was created by students in the Literary Magazine class to help promote our Book Fair Author, Allan Wolf, who wrote a novel in verse about the sinking of the Titanic, The Watch that Ends the Night. Students used the rich back matter of this book to create a “match-the-statistics” on survivors in 1st, 2nd, and 3rd classes, as well as write the names of countries of those on board the fated ship (these country names were written in a wave-like pattern beneath the ship). Blue-toned post-it notes featured the names of people and quotes, and viewers were invited to match the person’s name to the poem excerpt that described this character’s point of view. A final section of the Titanic Idea Wall featured a poem from the book and invited students to find words that showed onomatopoeia as well as words and phrases that used analogy or vivid language. November’s Idea Wall was also designed by the Literary Magazine students. Using the door theme again, fifteen door images were selected by the students (using Britannica Image Quest) and the students wrote writing prompts for each image. The school community was encouraged to select a door image that makes them curious, and write a poem, descriptive paragraph, or short story based on the writing prompt. The Literary Magazine editors will judge the entries, and winners will enjoy a pizza lunch with our January writing workshop author, Diane Stanley, as well as have the writing piece published in the Literary Magazine. Below is one example of an imaginative doorway image and writing prompt. The second whiteboard panel along the library hallway invites viewers to “Think about Thinking.” The first installation was titled “Thinking Fast and Slow,” and professional books were displayed tied to this theme: Making Thinking Visible, The Shallows, and I Read It But I Don’t Get It. A Venn diagram and laptop screen graphics encouraged viewers to add their experiences of when they think fast/think slow when using print sources or the internet. Though this first installation did not get interaction from students, fellow teachers liked having a space to highlight metacognition and thinking strategies. This year our faculty meets once a week in PLC groups, and one of the PLC groups reserved the Idea Wall in October to display an interactive Growth Mindset board and also displayed fiction and nonfiction books themed to “grit” and “growth mindset.” It was wonderful to have this Idea Wall space spearheaded by other faculty, and I anticipate that the PLC groups will take turns highlighting their learning on this portion of the Idea Wall. This also provides a great way to showcase our professional book collection to teachers! Modular furniture has been ordered for the library hallway opposite the Idea Wall, and I envision that this will make the space even more inviting for students. Faculty have been encouraged to reserve the wall space if they wish to brainstorm ideas connected to their curriculum, and once a few initiators try this out, I think more faculty and students will take advantage of using this space. 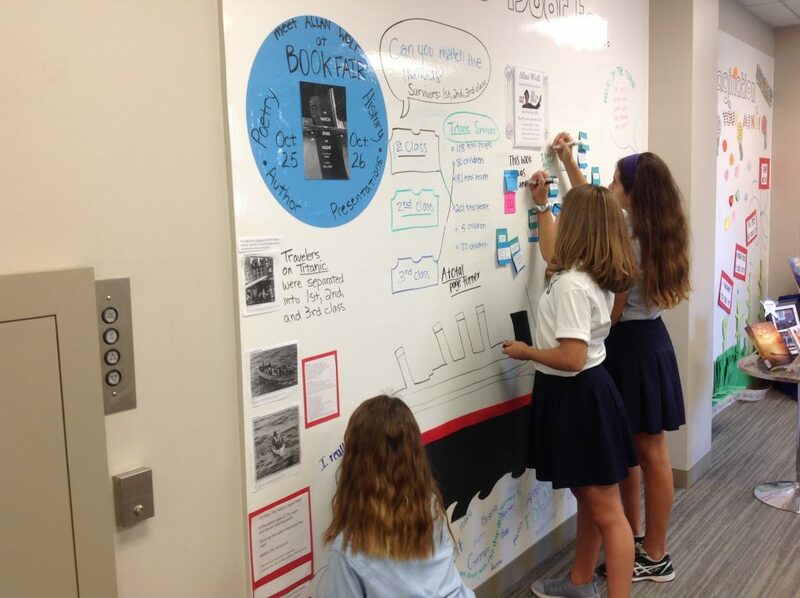 I look forward to hearing how your school incorporates Idea Walls to ignite ideas. This free Design Thinking toolkit includes Map Frameworks (maps to group thinking/data, as an alternative to a Venn Diagram). Nanniebots. Photography. Britannica ImageQuest, Encyclopædia Britannica, 25 May 2016. quest.eb.com/search/132_1304503/1/132_1304503/cite. Accessed 12 Sep 2017. The natural disasters caused by hurricanes Harvey and Irma challenged local residents and people across the nation to respond quickly and compassionately. As a librarian who finds inspiration and hope in stories, here are reflections on recent events in Houston and suggestions of 3 book themes that illustrate hope and resilience. Nationwide people responded quickly to solve logistics of supplying help and aid. The parent organization at my Houston school, Annunciation Orthodox School, set up a SignupGenius to send email alerts for a particular family’s needs, such as cleanup, making meals, picking up laundry, etc. Most requests were filled within the hour of the email alert, and individual volunteers managed their own signup duty. Picture book shows a young child buffeted by the storms of a problem.The child changes the perspective of fear to one of determination, facing the problem as an opportunity to make a difference. A grandmother helps a young girl overcome her fear of a looming thunderstorm by involving her in assembling the ingredients for a “thunder cake.” In this shared creative activity, the granddaughter’s fears are calmed. sees the problems of Malawi and invents a solution: a windmill to generate electricity and pump water. Using pictures of a windmill from a donated school textbook (Using Energy) and inventively assembling discarded scraps and a bicycle dynamo generator, William successfully creates the windmill. Read more on his blog. In the wake of Hurricane Harvey, huge garbage trucks rolled in from San Antonio and Austin to pick up flood debris; volunteers provided meals, clothing, and shelter; and crews from Louisiana’s Cajun Navy and Tennessee’s first responder teams joined local emergency crews and local residents with boats to rescue stranded flood victims. Images, videos, and shared stories of these amazing efforts inspired us. “Perhaps the seeds of redemption lay not just in perseverance, hard work, and rugged individualism. Perhaps they lay in something more fundamental—the simple notion of everyone pitching in and pulling together.” The American Olympic rowing team, competing in the 1936 Berlin Olympics, discover the importance of “the boat,” the joined efforts and shared love that can overcome impossible odds. Important to easing distress and fears is the creation of places of hope and refuge. The Houston Convention Center, church halls, family homes, and our schools were just some of the places transformed into shelters for flood victims and families. These temporary havens of safety allowed victims time to rest as they rebuilt their lives. In 1911, a fourteen-year-old girl, Joan, flees from her cruel father and the bleak future of farm life. Seeking a new life in Baltimore, Joan is stranded on the streets of a strange city until a kind man invites Joan to work for his Jewish family as a hired girl. What follows is a series of funny and charming misadventures as Joan, with her Catholic upbringing, blends her life and future goals with this compassionate Jewish family. Please share your favorite books of hope and resilience. Thank you for using stories to lift spirits of those in distress.